VINYL ON VINYL: ROBOTARS CUSTOM SHOW 2 OPENING TOMORROW! ROBOTARS CUSTOM SHOW 2 OPENING TOMORROW! The 2nd Robotars Custom Show features over 40 artists composed of graphic designers, painters and illustrators from Manila. Some of which are JeAA, Nico Deacosta, Sigmund Torre, Quiccs, Anjo Bolarda, Nemo, and awesome members of Ang InK and Pilipinas Street Plan. Special international artists from Singapore (curated by ToysRevil) and Rome (Street artist Bol23). Robtars (robot tarsiers) is an independently-produced designer resin figure by JomikeTejido, an architect and artist. This urban art toy is based on the tarsier, a threatened species of tiny primates found in the Philippines and represents love for the environment thru urban art. The figure is a 6-inch resin sculpture with a hidden storage pod in its head and includes a collector’s card. Jomike Tejido’s creation was inspired by his trip to Tokyo in 2007 and aims to let Robotars hop all over the globe. The exhibit is also the official launch of the 100 limited edition blindboxes of handpainted Robotars figures. 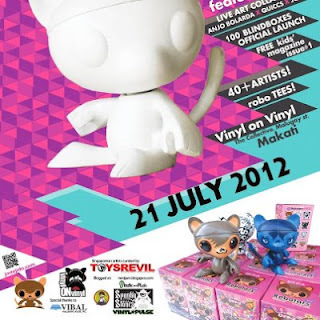 Among these, 12 chase figures were made by Filipino graphic artists, street artists, illustrators and painters such as Jason Moss, Electrolychee, Weewilldoodle, Mark Salvatus, Dex Fernandez, Zeus Bascon and many more. - The 1st release of Limited-edition Robotars tees! - Free Robotars kids’ magazines for early attendees! - A live painting collaboration with Quiccs, Anjo Bolarda and Jomike Tejido! - An on-the-spot design competition, with Robotars blindboxes and tees at stake! Enter our hero robotar (Artie’s) world today! Hop to www.jmtejido.com/robotars and play the free online game! Special Thanks to Vibla Publishing house and urban art bloggers ToysRevil, Geekmatic, Azraelsmerryland, Spankystokes, Plasticandplush, and Vinylpulse.